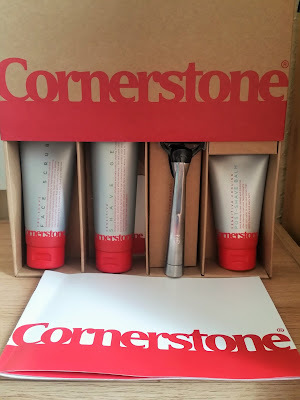 Cornerstone sent me their gift set which consists of everything for a comfortable shave. The gift set includes their entire range of quality shaving products as well as a personalised engraved aluminium razor handle which you can get engraved with up to three initials. I think this is a really great idea that u can get for yourself, so no one touches your razor! Or would make a lovely meaningful gift to someone. Also there is a gift card included that you can use when your supply runs out from your box. 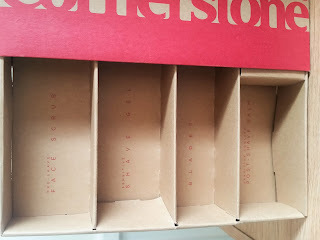 The box you receive is well packaged and comes with cornerstone printed on the box. 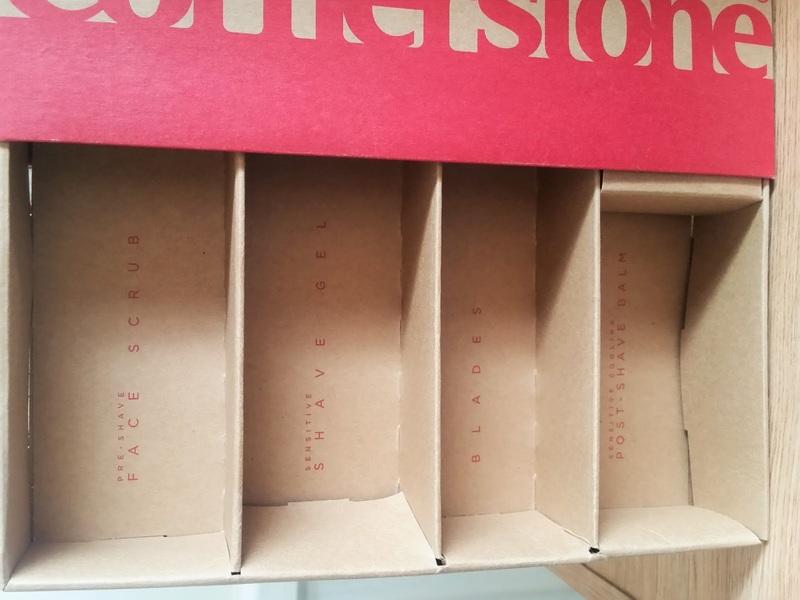 To access the contents you pull out from the bottom like opening a draw and you will see all the products you need to start you on a perfect shave. 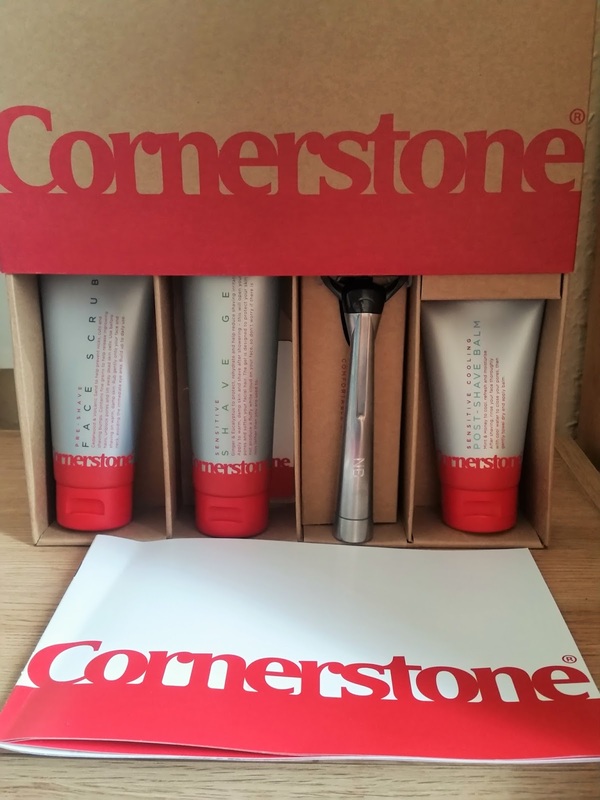 In the leaflet book you receive, there is a handy step by step guide to use the products at there full potential and to help you achieve a hassle free shave. I think this is a really good idea to add to the kit especially if you are buying this for a teenager and they have no idea on how to shave and what to do. Outlines to take a warm shower to open your skins pores and to soften your stubble which will make it easier to achieve a closer more comfortable shave. Use the pre-shave scrub to exfoliate to clear pores and to help release ingrown hairs. Doing this step will create a smoother surface layer to stop shaving cuts and help make your skin look clearer. 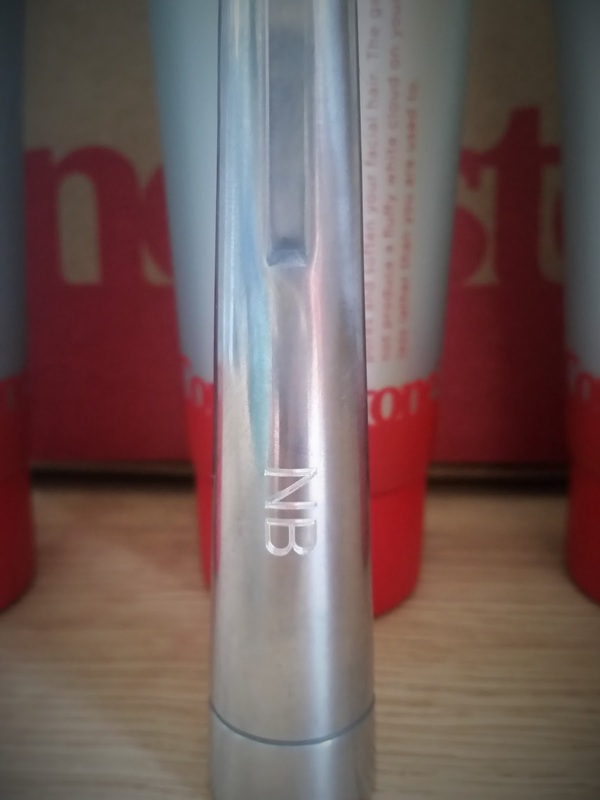 The pre-shave face scrub is 100ml and greets you in a classic silver squeezable tube with a vibrant red snap cap. Cedarwood and Volcanic sand help prevent nicks, cuts and shaving bumps. 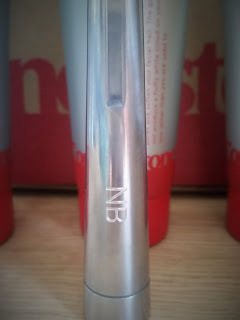 The liquid is grey and has a runny consistency but is filled with lots of fine grains that really do leave your skin so soft and smooth like u have used an expensive product! This for sure works and helps prepare you for the next step in your shaving routine. The sensitive shave gel is 150ml and is enriched with Ginger and Eucalyptus to protect, hydrate and reduce shaving irritation. A little of this gel goes a long way and smells so fresh it awakens your senses with its unique masculine scent. This doesn't lather up like a large white fluffy cloud and its not intending to as its job is to protect your skin and does it so well! The razor! For a comfortable shave they suggest using a fresh blade and changing your blade once a week. Whilst using your new razor take things slow and get used to using it, there razor blades are sharp metal. Cornerstone found a factory in the heart of industrial Germany that has been making blades since 1920's where they have developed a special method of precision grinding their razors which makes them sharp and durable. So you really are using a Great razor! Only shave in the direction of your stubble to minimise skin irritation or ingrown hairs. For a closer shave make a second pass over the same area, if required repeat this step at a right angle to the direction of your stubble to give you a closer finish. Never shave against the grain of your stubble as this might give your a closer shave but your skin will not thank you later from the skin irritation. 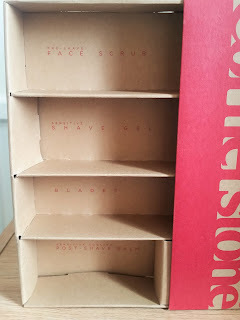 The best easy shave i have experienced yet with the five sharp - fine blades mounted on a flexible head with a Vitamin E and Aloe Vera strip that runs so smoothly and closely, its a pleasure to use. Wash off any remaining shave gel with cold water to close your pores, gently dry your face and apply the sensitive cooling Post-shave balm. This helps to replenish lost moisture and keep skin irritation at bay. The product is a white medium consistency and spreads really easily all over your skin. It is instantly absorbed and you can feel this getting to work right away leaving your skin super soft and cooling any irritation away with its cooling effect and minty scent. The razor has a really nice feel and fits into your palm with ease. You can also stand this up with its unique base on its handle so its not laid down or coming into contact with other products. The kits also includes six razor blades and like they suggest, these will last you six weeks if you change your blade once a week. 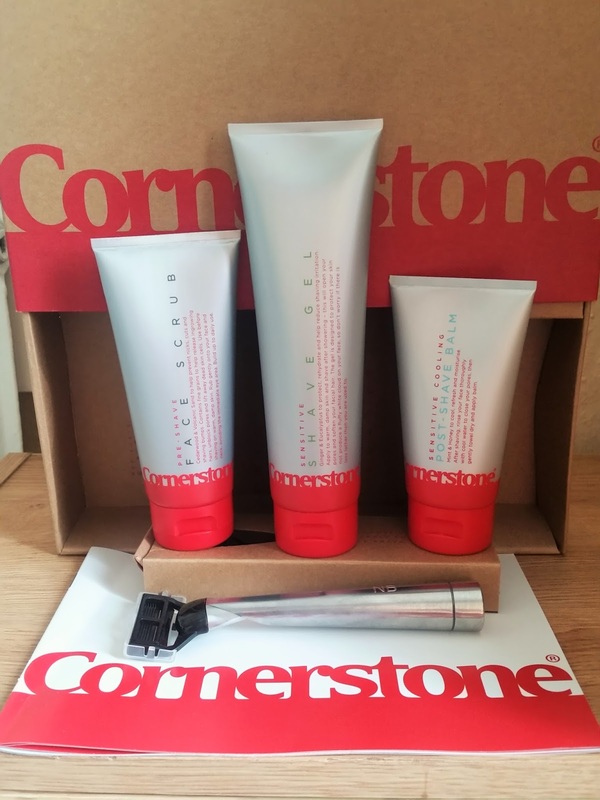 The shaving products really work to achieve a better shave and were blended on British shores by expert chemists and dermatologists so you know you are using quality products. ten pounds on your shaving supplies. All you need to do is make an account and your find a unique referral code to share. You can also change the contents of your box by adding or removing products and also put your shave plan on hold if you are not getting through your razors or your growing a beard! Check out cornerstone on the link provided and experience the best shave your face will love.